Six months after a petition to remove certain controversial food dyes from Kraft Macaroni & Cheese products made national headlines, the company has announced that it will remove artificial dyes from three kid-targeted mac and cheese products. However, Kraft will continue using the dyes in the “original flavor” versions that include elbow macaroni. According to the AP, Kraft denies that this decision has anything to do with the Change.org petition that has gathered around 350,000 signatures since being posted in March. Because heaven forbid the company appear to be responding to a massive public request. 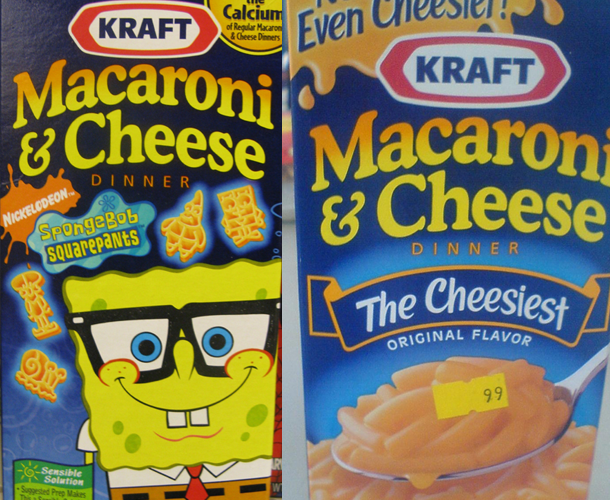 While the elbow macaroni versions of Kraft mac and cheese that most people have in their cupboards will still use the artificial dyes, Kraft will stop using the coloring in products with SpongeBob Squarepants, Halloween and winter shapes, along with two new pasta shapes to come. The artificial dye will be gone and paprika will be used to boost the coloring, explains Kraft. The dyes in question aren’t used in Kraft products in Europe, and the company offers items stateside that don’t use artificial dyes. Considering the company already goes the natural coloring route elsewhere, why can’t it make the change across the board, argued the petitioners. The mom who created that petition told the AP that this is just the first step in the long process of changing Kraft’s ways. Previous McDonald’s Has Pumpkin Pie. Don’t Eat It.